We are one of the leading manufacturer & exporter of Suspension Magnet. Our other products are Material Handling Equipment, Industrial Conveyors, Industrial Crushers, Blending Machines, Industrial Plants, Hydrocyclone Separator and many more. 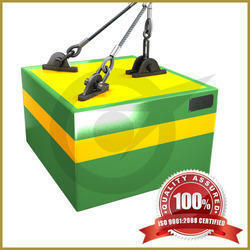 Suspension Permanent Magnet is suitable for continuous-duty occasions with a few ferrous metal objects to be removed. this equipment has a high magnetic field intensity, no energy consumption and a long service life. it is easy to install and use without maintenance. this equipment is widely used for the ferrous metal removal from non-magnetic materials on belt conveyors, vibrating conveyors, vibrating feeders, chutes, etc. The wholly sealed structure makes the separator water-proof, dust-proof and corrosion resisting. Recover ferrous metal in the waste management process. Suspension Electro Magnet is used for removing iron from powdery or lumpy non magnetic material. When the electric current pass through the iron core,the energy of magnetic force is produced, then a high intensity magnetic field will be produced if the insulated wire coil is wrapped around an iron core. So when the electric current pass through the insulated wire coil a stronger magnetic field is generated. we can use the magnetic field to work, producing qualified electromagnetic separator to meet customer requirement. Magnetic circuit adopts computer simulation design, so it has a deep penetration strong magnetic force and high field gradient and can provide max attracting force. The shell of suspension elctro magnet is welded by sealed steel plate and has gone through a strict test of air-proof. meanwhile, a vacuum filling epoxy resin has been added between coil and shell to enable the equipment work well even in harsh working conditions. Natural cooling mode is adopted which causes a less risk of fault occur. The suspension electro magnet can remove 0.1~35 kg materials from non-magnetic materials and the removing rate can up to 95% or more. Suspension Magnet are engineered for use in high volume and deep burden applications. Their primary advantages are their "deep reach" and the ability to be turned on and off. Mounted over a vibratory bed or belt conveyor, these magnets set the industry standard for strength. Suspension Magnet consisting of aluminium or copper wound coils immersed in a transformer oil (for prevention of overheating or shorting) or air-cooled for extreme or dusty environments. 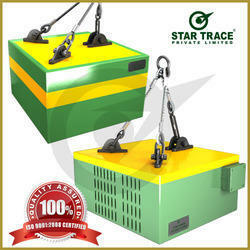 All electro suspension magnet comes along with control panel. Operating heights up to 150 mm to 450 mm are available. Manually cleaned magnets can be supplied with a stripper mechanism. No power consumption, virtually maintenance free. 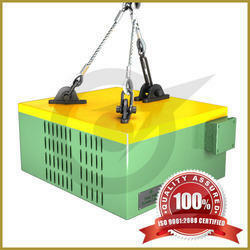 Suspension Electro Magnet is used for removing iron from powdery or lumpy non magnetic material. When the electric current pass through the iron core, the energy of magnetic force is produced, then a high intensity magnetic field will be produced if the insulated wire coil is wrapped around an iron core. So when the electric current pass through the insulated wire coil a stronger magnetic field is generated. We can use the magnetic field to work, producing qualified electromagnetic separator to meet customer requirement. The shell of suspension electro magnet is welded by sealed steel plate and has gone through a strict test of air-proof. Meanwhile, a vacuum filling epoxy resin has been added between coil and shell to enable the equipment work well even in harsh working conditions.